DUMBARTON failed to sparkle in their Irn-Bru Cup second round tie at home to Montrose, exiting the cup 1-0. DUMBARTON failed to sparkle in their Irn-Bru Cup second round tie at home to Montrose, exiting the cup 1-0 in front of a 456 crowd. They went down 1-0 in a physical tussle on a sunny afternoon, continuing their recent ron of bad defeats. The visitors were more lively in the opening exchanges, but Sons defended well. However, as Dumbarton started to come back, Montrose struck. Graham Webster had acres of space on the right and his cross was met by Craig Johnston who rose high to head home on 19 minutes. Sons had a couple of chances late in the half, but could not convert. After the break both sides struggled to impose themselves on a game that often lacked shape and pace. On 66 minutes Ross Forbes cut in towards the area, but his shot from 22 yards crashed against the top of the far post — the nearest the home side had got to scoring. 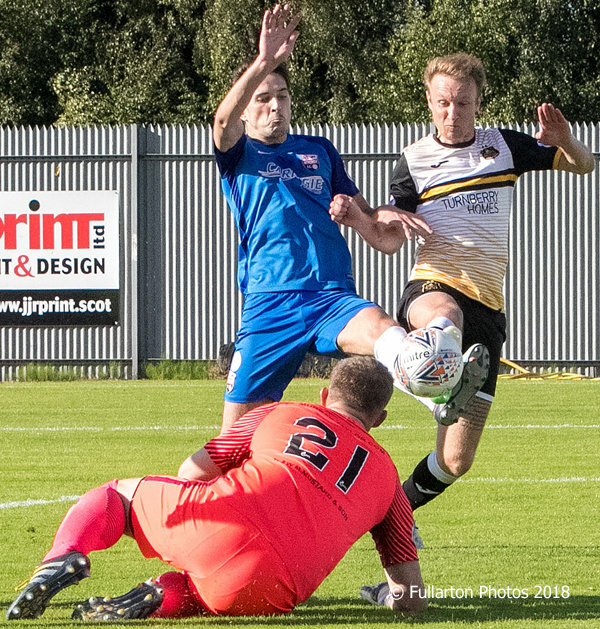 In the final minutes there was a trio of chances for Dumbarton. One skimmed the crossbar from a corner, one was scrambled away and a third was plucked out of the air by Montrose keeper Jordan Miller. Iain Russell is pictured with a close range shot which went narrowly past.